When Google Chrome web browser is running and opening with a single or multiple tabs, the computer cannot goes into low power sleep, standby or hibernation mode as per configuration and settings in Power Options of Control Panel or Power & sleep of Settings app, even though monitor or screen is turned off. The issue is immediately resolved, i.e. device can now sleep or hibernate, once Chrome window is closed. The Chrome prevents and stops Windows system from going into sleep, stand-by or hibernation because one or more of the web pages (tabs), extensions or apps is using the system resources, effectively telling Windows that Chrome is still actively performing some tasks, and hence do not put computer into sleep, stand-by or hibernation mode. Instead of exiting and closing the whole Chrome web browser, you can try to identify the culprit which is running process that is making the power requests, preventing the system from sleeping, standing-by or hibernating. If you’re seeing the results that Chrome is playing audio and/or is playing video, identify the web pages that are playing the audio and/or video, and then close the tabs to resolve the Windows won’t go to sleep, standby or hibernate when Chrome is running issue. Do pay attention to video ads, audio ads, Flash ads and other multimedia advertising that can play video and sound. Normally, a speaker icon is shown on the tab when the tab is playing an audio stream, helping you to identify it. Such websites include YouTube, Netflix and etc. If you’re seeing Chrome is uploading data as one of the power requests on execution category, then the identification of the causing culprit is much harder. Any extensions, apps or tabs in the Chrome may prevent the Windows from sleeping, standing-by or hibernating. To troubleshoot it, disable extensions, plugins, apps, and tabs one by one, until the power requests made by Chrome is gone. Some common Chrome apps, extensions, plugins or websites that may cause Chrome to hold power requests indefinitely including Outlook.com, Adobe Flash Player, Yahoo! Mail, AwesomeScreenshot, Zeverator, Google Play Music, Motorola Connect, Adsblock Dropbox synchronization, Remember The Milk (for Gmail) and many more which normally involves background processes or updates. Windows provides option that allows users to set a power request override for a particular process, service, or driver. 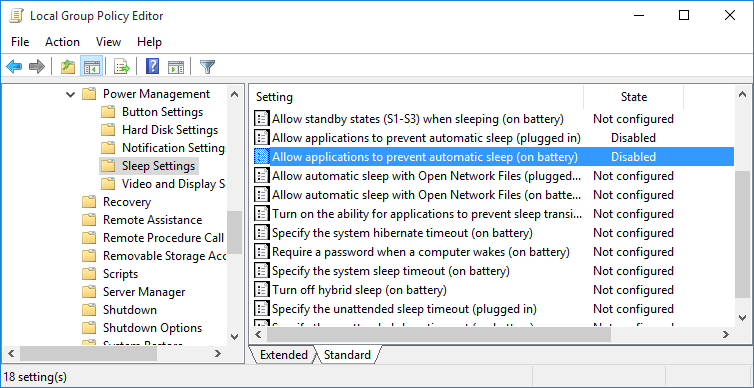 We can set a power request override for Chrome, so that any power request made by Chrome will not stop Windows from going into low power sleep, standby or hibernate state. This trick will apply on all programs and applications, not just Chrome. Go to Computer Configuration -> Administrative Templates -> System -> Power Management -> Sleep Settings.